The joy about working in precious metals is that for part of the weekend you can switch off. There is a precious time when markets are closed and you don’t have to worry about market movements and what might be happening. You check back in on Sunday afternoon/evening and can delight in the markets starting to wake up for the week ahead. This isn’t the case in cryptocurrencies. This weekend crypto-currency market participants got a wake-up call as to what 24/7/365 market trading really means. They watched the price of bitcoin plummet around 10% on Sunday morning (EST) alone. This contributed to bitcoin’s overall fall of 25% since last Thursday and into the weekend. Other crypto currencies fell by more. The volatility is so bad that if you are one of the few with a bitcoin app that allows you to actually spend your bitcoin then you might have found yourself paying for a brunch that was a hell of a lot more expensive than when you originally sat down to order it. You then might have noticed as you left the cafe that the currency was in full recovery mode and that brunch needn’t have been so expensive after all. Just over one month ago bitcoin was flirting with $3,000, appearing on the front pages of financial magazines and Google saw record searches for ‘Bitcoin.’ On Sunday’s crash the price reached $1,863 but as I write this early Thursday morning (BST) it’s at $2,351. What is this volatility all about and how can cryptocurrency proponents claim that this new money will change the world when its price behaviour can barely manage to guarantee we’ll be able to afford breakfast? It seems the market cannot decide if this is a store of value or just of little value? Volatility – what does it mean and does it matter? Bitcoin remains the least volatile of the cryptocurrencies mainly thanks to its time-served, adoption rates and that it has the highest liquidity. But, we are still talking about a currency which was $600 around a year ago and is now close to $2,400. Even diehard bitcoin fans have to admit that we are in a speculative boom phase. This applies to all cryptocurrencies, not just bitcoin. If the last two decades have taught us anything about investments it is that speculative boom phases in technology are ones which should be approached with caution. No one knows what the speculation phase says about future valuations or how the product (and its market) will mature. Currently we are in a speculative phase which will soon have to either sit down and shut-up or stand-up and show how this hyped market is going to move from proof-of-concept, significant investments and use-case scenarios through to in-use case scenarios and people actually using cryptocurrencies. At the moment, the majority of traders are either disinclined to learn more about what the future of these cryptos could be or they are just profit-seeking. This created spikes and huge volatility. All cryptocurrencies are volatile but the speculation which creates the volatility is not only profit-seeking but also quite uninformed. You can tell this in the way that the three major/most popular currencies track one another. Bitcoin, Ripple and Ethereum are significantly different cryptocurrencies, yet they have closely tracked each other recently. Ripple (unlike Ethereum and bitcoin) is largely a privately held currency focused on the interbank transfer market. Ethereum is basically a ‘smart’ system which is robust and already widely adopted for complex data-sharing systems. It has been embraced by the banks. Indeed, thirty big banks, tech giants, and other corporations—including J.P. Morgan Chase, Microsoft, and Intel—are uniting to build business-ready versions of the software behind Ethereum and it’s decentralised computing network based on digital currency. And finally, bitcoin which whilst it might be the first one and therefore has high adoption rates and greater stability, it is also the one with the least features. More recently bitcoin has been traced by Dash and XMR, also different in offering to bitcoin. The fact that these vastly different cryptocurrencies are mirroring each other suggests that we are still in the phase of the market where the majority of traders lump as ‘cryptocurrencies’ and are failing to see the difference. And, even if they are seeing the difference they are perhaps hedging their bets as to which one will ‘make it’. They could all ‘make it’ given their different capabilities and applications. At the same time, there is likely to be massive “creative destruction” in this space and there is the risk of failure – especially in the altcoin space. 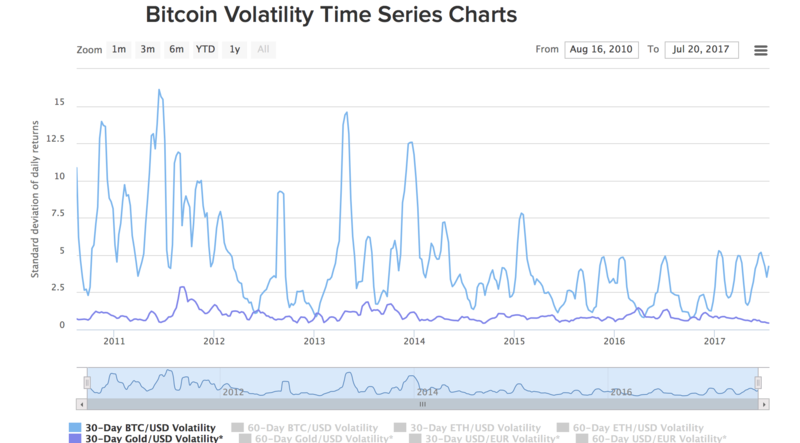 Of course, it is likely that bitcoin’s volatility will slow over time. Currently its annualized volatility is 75 percent (gold’s is 10%) but that could improve when one considers gold’s was as high as 90% in the 1970s as the US abandoned the gold standard and stagflation badly impacted western economies an investors. Therefore, we should not dismiss cryptos but we should approach them with caution and be careful not to declare it as the new ‘gold standard’ of investments. Are digital currencies replacing gold? One of the longest surviving myths about bitcoin is that it is competing with gold. Since bitcoin once again caught the attention of the mainstream its competition with gold has proven to be quite the clickbait for those looking to offer comment on the cryptocurrency. This week Fundstrat’s Tom Lee dubbed bitcoin the ‘new gold’ (yawn) and claimed that ‘Cryptocurrencies are cannibalizing demand for gold.’ This may not appear to be the case when we look at recent gold demand figures in countries such as India, but will it impact long term? But how can they trust bitcoins? Or any cryptocurrency for that matter? Damodaran believes they will trust them because they no longer trust paper currencies. The issue with paper fiat currencies (now digital fiat currencies) is that they have a history of failing and the fiat system we currently operate on is relatively new. So, why are bitcoins (or another digital cryptocurrency) suddenly going to save the day? It is vital millennials consider the performance of an asset over a long-period of time, as they are just starting to build their portfolios and need to prepare for the next 20, 30, 40 years or more. Whilst bitcoin (and Ripple, Ethereum etc) may have some years behind them, they are mere ‘babies’ when compared to time tested gold and silver. Not to mention that the time they have accrued has only shown volatility, with investors taking one of the biggest punts of their lives. This isn’t to say that bitcoin etc have no future and are not worth allocating a very small amount of a portfolio to. Instead we return to the point of view we have long maintained – gold and bitcoin are complementary assets, not competing ones. Cryptocurrencies are for real and some will evolve and survive and thrive. Which one, or which handful, are for keeps who knows. Only time will tell. Where the price will go from here, we’re unsure and that’s no bad sign given the volatility. We’re certainly not as confident as John McAfee who is so sure the price will hit $550,000 within three years that he has bet his own manhood on it. No matter what you think of bitcoin you have to agree that it will take a rally of monumental proportions to protect the the virility of Mr McAfee. Like any new tech investment, investors should approach with caution. It’s no bad thing to take a punt on something you believe will bring long-term value and gains whilst insuring you have some financial insurance in the form of gold and silver as well. This is how many investors should look at gold and bitcoin. Bitcoin is the child with great potential and it might help fund your retirement if you’re lucky, but you can’t guarantee it won’t go off the rails. So best make sure you’re still saving on your own and stocking up on some time-proven physical gold and silver.